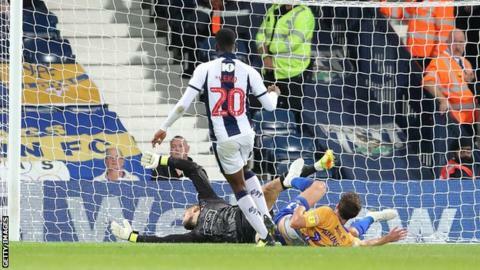 Jonathan Leko and Kyle Edwards scored their first West Brom goals as the Championship side beat Mansfield to reach the Carabao Cup third round. Leko finished from close range on 26 minutes after Oliver Burke raced past a static defence and squared the ball. League Two Mansfield equalised midway through the second half when Neal Bishop fired in from outside the box. It took just six minutes for Albion to regain the lead, as Edwards cut into the area before lashing the ball in. Mansfield came close to equalising during a frantic finale but West Brom held on to maintain their 100% record against the Stags. Match ends, West Bromwich Albion 2, Mansfield Town 1. Second Half ends, West Bromwich Albion 2, Mansfield Town 1. Corner, Mansfield Town. Conceded by Kyle Howkins. Attempt missed. Krystian Pearce (Mansfield Town) right footed shot from the centre of the box is close, but misses to the left. Assisted by Tyler Walker following a corner. Attempt blocked. Bobby Olejnik (Mansfield Town) right footed shot from the centre of the box is blocked. Attempt blocked. Alexander MacDonald (Mansfield Town) right footed shot from outside the box is blocked. Attempt saved. Danny Rose (Mansfield Town) header from the centre of the box is saved in the bottom right corner. Assisted by CJ Hamilton with a cross. Attempt missed. Jordan Graham (Mansfield Town) right footed shot from the centre of the box is close, but misses the top right corner. Assisted by Alexander MacDonald. Attempt missed. Alexander MacDonald (Mansfield Town) right footed shot from outside the box misses to the left. Attempt blocked. Jordan Graham (Mansfield Town) left footed shot from the left side of the box is blocked. Assisted by Otis Khan. Foul by Tyrone Mears (West Bromwich Albion). Attempt saved. Danny Rose (Mansfield Town) right footed shot from outside the box is saved in the centre of the goal. Assisted by Tyler Walker. Attempt saved. Danny Rose (Mansfield Town) left footed shot from the centre of the box is saved in the centre of the goal. Assisted by Ryan Sweeney. Oliver Burke (West Bromwich Albion) wins a free kick in the defensive half. Danny Rose (Mansfield Town) wins a free kick on the right wing. Substitution, Mansfield Town. Jordan Graham replaces Malvind Benning. Attempt missed. Harvey Barnes (West Bromwich Albion) right footed shot from the centre of the box misses to the right. Assisted by Rekeem Harper. Attempt missed. Dwight Gayle (West Bromwich Albion) left footed shot from a difficult angle on the left is close, but misses to the left. Assisted by Tyrone Mears with a cross. Attempt missed. Alexander MacDonald (Mansfield Town) right footed shot from outside the box is too high from a direct free kick. Danny Rose (Mansfield Town) wins a free kick in the attacking half. Alexander MacDonald (Mansfield Town) is shown the yellow card for a bad foul. Substitution, West Bromwich Albion. Dwight Gayle replaces Jonathan Leko. Substitution, West Bromwich Albion. Harvey Barnes replaces Kyle Edwards. Delay in match Kyle Edwards (West Bromwich Albion) because of an injury. Goal! West Bromwich Albion 2, Mansfield Town 1. Kyle Edwards (West Bromwich Albion) right footed shot from the centre of the box to the top right corner. Assisted by Conor Townsend. Attempt missed. Danny Rose (Mansfield Town) right footed shot from outside the box is too high following a set piece situation. Substitution, West Bromwich Albion. Kyle Howkins replaces Craig Dawson.